After bringing Feist, Todd Terje, (Sandy) Alex G and more to la belle province for their sophomore edition last year, organizers behind Quebec's Festival Santa Teresa have revealed the initial lineup for their 2019 event. 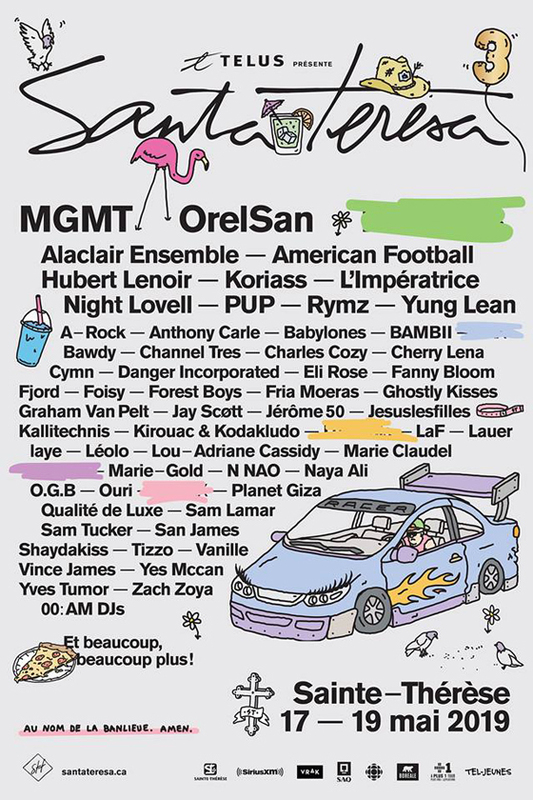 The fest's first announcement finds MGMT and OrelSan atop the bill, followed closely by American Football, Hubert Lenoir, Yung Lean, PUP, Night Lovell, Alaclair Ensemble, Koriass, L'Impératrice and Rymz. Other names appearing in the lineup include Yves Tumor, Graham Van Pelt, Forest Boys, BAMBII, Danger Incorporated, Eli Rose, Fria Moeras, Ghostly Kisses, Sam Tucker, N NAO, Kallitechnis, Planet Giza and more. The festival runs from May 17 to 19 in the Montreal suburb of Sainte-Thérèse. Tickets are set to go on sale Friday (March 15) at 10 a.m. local time, with the first 2,000 general admission tickets available for only $10 if purchased within 48 hours. Find further ticketing details through the festival's official website. Yung Lean Shares Video for "Friday the 13th"
Yung Lean Returns with "Like Me"